Notre Dame hasn’t officially announced the start of spring football, but it’s never too early to take a look at some of the interesting battles that will define the next 15 practices for the Irish. Here’s a quick run down of what we could be looking at this spring. The first one will be at receiver and it might not be clear at which position just yet, but it’s safe to say there will be fierce competition to take over the vacated role of Miles Boykin, who recorded 59 receptions for 872 yards and eight scores in 2018. Chase Claypool and Chris Finke return for their final year in the blue and gold with prominent roles expected. Notre Dame has interesting pieces in freshmen Lawrence Keys III and Braden Lenzy, who fill a speed role but have zero playing time to their name. Lenzy looks like a completely different player than when he showed up in June, while Keys has also gained some much-needed weight. Kevin Austin Jr. got playing time in the fall as a freshman, but never consistently found a role. Michael Young will be in a junior in 2019 and made things happen with the football in his hands in 2018. Young was targeted just 10 times last fall, but he made seven receptions for 138 yards and one touchdown. If Notre Dame can get Austin, Keys, Lenzy and Young to take steps forward this spring, it will allow Notre Dame to rotate receivers more but also become much more explosive on the outside. On the offensive line, Notre Dame needs to fill the hole three-year starter Sam Mustipher left behind. 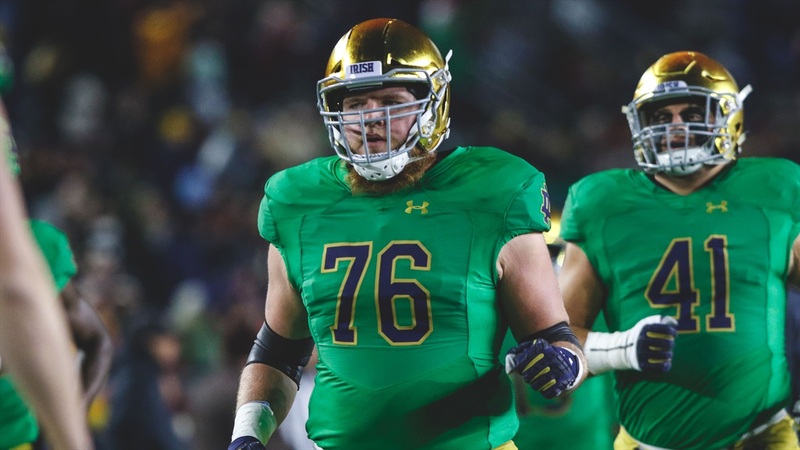 The first name that pops up is fifth-year senior Trevor Ruhland but will Notre Dame go with a veteran (and somewhat injury prone) over developing its next long-term center? Notre Dame is in a ‘Win Now’ mentality, so it’s going to be a tough decision to make. Dillan Gibbons will have three more seasons at Notre Dame and is the second name who comes to mind for the vacancy. However, Jeff Quinn may want him to stay at guard to compete with Tommy Kraemer at right guard. Gibbons had momentum and positive rumblings being said about him at the end of the regular season before a foot injury during bowl prep sidelined him and we expect him to ready for spring ball. Another option brought about in the world Social Media is moving Robert Hainsey to center. I’m not sure that’s the best move, but it’s a potential option as you’re looking at Luke Jones or early enrollee Zeke Correll as the next option. Now, I will say it does intrigue me if Hainsey does get a look at center because it could potentially allow for Liam Eichenberg to move to right tackle and Aaron Banks to left tackle, which would allow for Gibbons and Josh Lugg to potentially compete at left guard. Lots of movement and hypotheticals with that move but it could be something to watch. I would have added running back, but I think that battle will be a wait and see one as they get acclimated to new running backs coach Lance Taylor. There are a ton of bodies in the stable and I think you could see Jafar Armstrong or Tony Jones Jr. rise to the top in the spring, but I’d also be somewhat surprised as there will be plenty of reps given out amongst the unit. On the defensive side of the ball, the linebacker job will be fascinating to watch. Will Asmar Bilal be given a chance the move inside to play Buck, which I believe he would love to do. Much like Ruhland at center, Bilal moving inside doesn’t help Notre Dame long-term. I’d love to see a combination of Jordan Genmark Heath and Shayne Simon team up on the inside to give Notre Dame more athleticism and speed but who is going to play Mike? Bo Bauer seems like a logical candidate to play Mike but will he be ready to take on a much more significant role as just a sophomore? Jonathan Jones will be a senior with two years remaining and played well in a limited role a year ago. He’s an energy guy and one who seems to unite the team, so it might not seem like a stretch from a leadership perspective. The X-factor could be Jeremiah Owusu-Koramoah, who missed almost all of last season with a broken foot. If he can make a jump in his second spring, Notre Dame could feel more comfortable with moving Bilal inside and or Shayne Simon inside permanently. Owusu-Koramoah probably has the most athleticism out of the group at Rover, but he has the least amount of experience as Simon got action last fall in a variety of roles. Cornerback will have a battle to see who starts opposite Troy Pride Jr., but we’re going to put that on the backburner as that one will continue into fall camp. Shaun Crawford likely won’t take contact this spring, while there will be plenty of bodies being tested in spring. Safety is locked down with Alohi Gilman and Jalen Elliott, but I think Notre Dame would love to get more of a rotation in 2019 to keep snap counts a little lower and to build experience as both players could be gone after next fall. Devin Studstill, Derrik Allen, Paul Moala and Houston Griffith figure to compete there. Studstill has shown growth, but Elliott exploded on the scene after struggling his first two seasons. We don’t know too much about Allen as he redshirted last fall. I believe he had a good bowl prep for the most part, which included a pick-six in practice. Paul Moala got some mop-up time at safety as he held a special teams role for most of the year. It will be interesting to see where Houston Griffith ends up as he played nickel as a freshman but then was replaced towards the end of the year by senior Nick Coleman. Griffith had the usual ups and downs of a true freshman playing out of position, but there were times it looked like he was close to grasping it. Does he stay at nickel or does Notre Dame move him to safety? You’d figure there is more playing time available at nickel barring injury to Gilman or Elliott.